Located in the Davidson Commons/Harris-Teeter Shopping Center, near the Davidson Day School and the Community School-Davidson, we offer a perfect solution for students or parents looking for a meal going to or from school. Come enjoy one of our fresh-grilled burgers, fries or milkshakes to find out why we are considered the best burger joint in North Carolina. At Char-Grill, you can be sure you will eat fresh food, we will never serve you mass-produced, tasteless patties that have been stored in a freezer for days. We make our burgers from USDA grade Angus beef, ensuring you will get a high-quality, juicy burger prepared before your eyes on our open-flame grill. In fact, every ingredient we use, from melted cheese, crisp lettuce to our succulent tomatoes will come to you fresh, never leaving our customers unsatisfied with our food. Our great tastes are not only a result of our ingredients, but also preparation. We cook all of our meals over an open-flame grill, giving your food a delicious crisp on the outside, with a warm, juicy inside. We cook all of meat over a bed of lava rocks, which are natural and porous and can evenly distribute heat to ensure each meal is cooked to perfection. 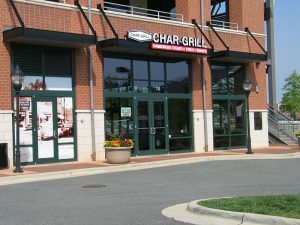 Char-Grill loves talking to our customers, feel free to give us a call at 704-896-8710 to tell us about your last great dining experience, or feel free to call ahead with orders. If you are one of the many Char-Grill fanatics, we also invite you to join our fan club or check out our specials page, as our way of saying thank you for your continued loyalty and support.